The extraordinarily high civilian casualty count during the recent Israeli offensive into Gaza is becoming easier to account for. It appears that Israeli soldiers were using a points system that encouraged civilian Arab deaths. Pregnant women were especially “high-value” targets for the network of eager Israeli snipers. At the end of the campaign, the Israelis had lost 13 brave young men. The Palestinians had lost 1300 – two thirds of whom were civilians. 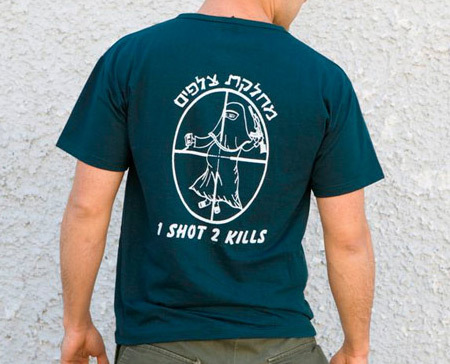 To celebrate this great victory, the Israeli army had the above t-shirts printed showing a pregnant Muslim woman within the crosshairs of a sniper’s rifle and the words, “1 Shot 2 Kills.